It’s that time of year again! Sunday, August 6th is the date for the Riverview Farmers Market’s 6th Annual Perfect Peach Pie Contest. If you’re an amateur baker with a favorite peach pie recipe, read on to find the contest rules and other basic information below. We’re also planning a Market day full of live music, kids’ activities, peachy treats from our vendors, and more. JC Families will be organizing a kids’ craft activity (make a paper peach pie!) and a visit from a bubble entertainer from 10:30-12.00. TO REGISTER, INTERESTED PARTICIPANTS CAN CLICK HERE TO DOWNLOAD A REGISTRATION APPLICATION. Entrants can also register and submit pies at the Market on the day of the event, at the registration/info table, until the 11:30 a.m. preferred deadline on Sunday, August 6th (no entrants will be accepted after 12 pm!!!). Judging will take place at noon on August 6th. Three winners will be selected by local judges. 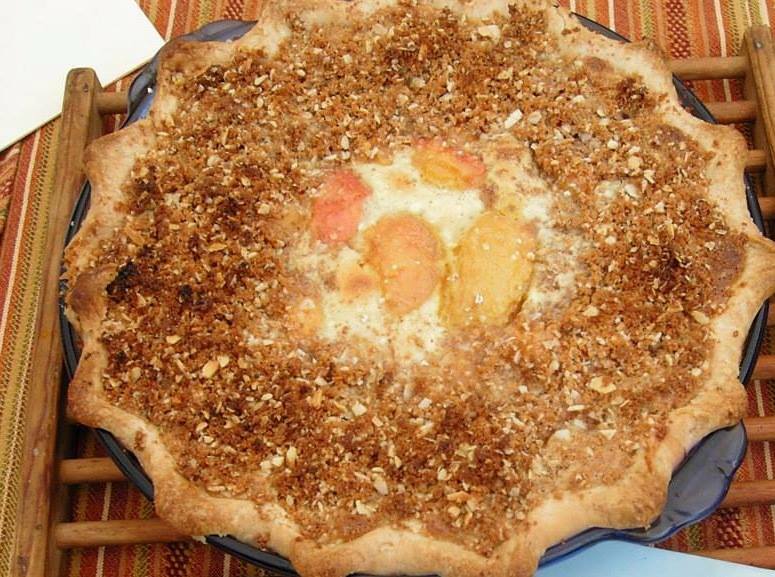 Judging criteria (established by the NJ Peach Promotion Council) will include: overall appearance, crust puffiness and color, arrangement of peaches (in open-top pies), aroma, filling color, filling taste, and crust taste. Also, thanks to Remco Press of NJ for designing and printing our flyer for this contest and party! 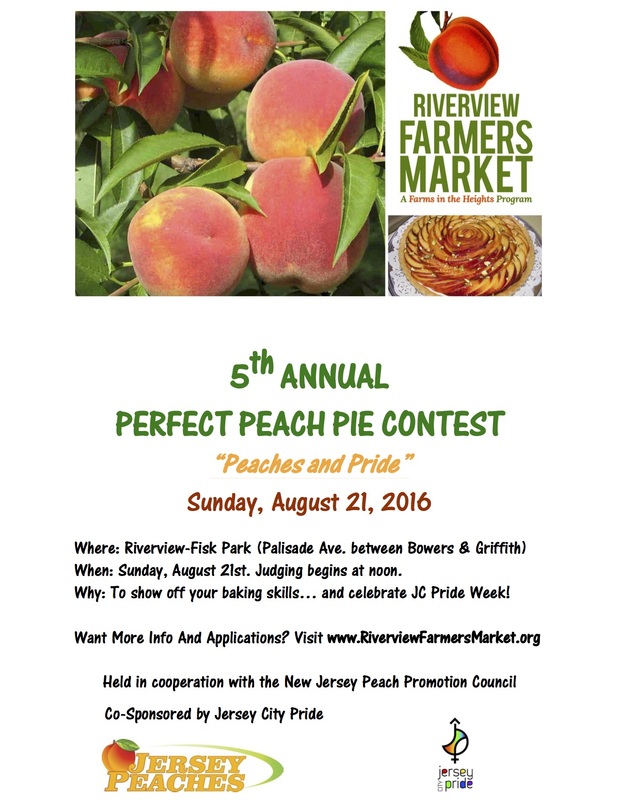 It’s time for the Riverview Farmers Market’s 5th Annual Perfect Peach Pie Contest, sponsored by the New Jersey Peach Promotion Council, and we’re expanding to make the day bigger and better than ever! Sunday, August 21 is the Market’s celebration of “Peaches & Pride.” The 15th Annual Jersey City LGBT Pride Festival is taking place August 21-29, so we’re also teaming up with co-sponsor Jersey City Pride. 11:00 AM – 2:00 PM: Slow Fashion FFFARS Used Footwear Drive: donate your gently used footwear and raise money for local non-profit organizations. Prizes will be donated by sponsors and local businesses including Modcup coffee co., Andreas Salumeria, Yoga in the Heights, The Lucky Honeybee, The Corkscrew Bar & Grill, A Little Gelato, and Rizzo’s Bakery and Pizzeria. Our vendors Dolce Semifreddo, Bread & Spoon, and Jersey City Veggie Burgers will be offering special peach-themed items, and if you still haven’t had your fill of peaches, you can buy some from our farmer vendors, Alstede Farms, Stony Hill Farms, and RH Farm. See you on Sunday! In the meantime, spread the word to your friends and neighbors in the Heights! 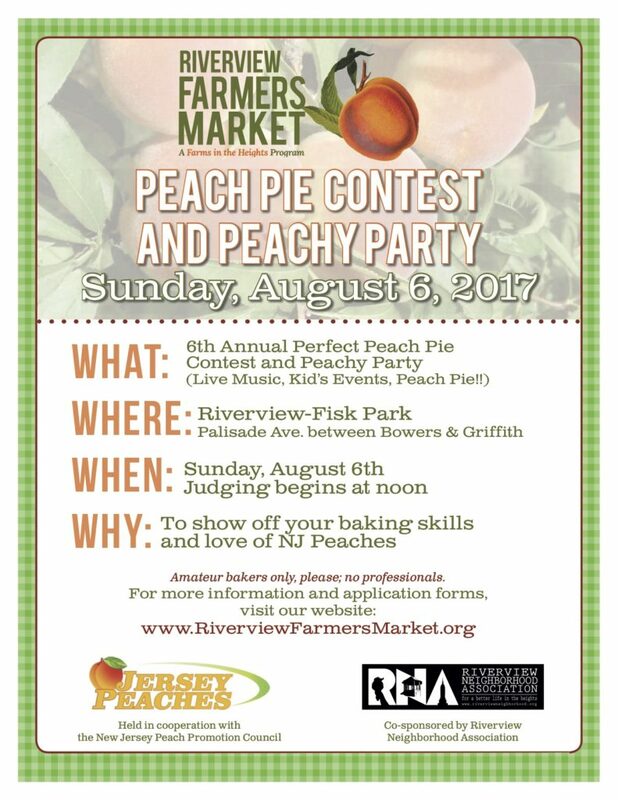 Summertime, and the livin’ is easy… and it’s time for the Riverview Farmers Market’s Annual Perfect Peach Pie Contest. If you’re an amateur baker with a favorite peach pie recipe, you have just three weeks to fire up your oven and perfect your technique! The contest rules and other basic info are posted below. We’re also planning a Market day full of music, kids’ activities, peach-themed treats from our vendors, and more — details to come, so stay tuned! All New Jersey residents are welcome. All ages are welcome to submit, but you must be an amateur baker, not a professional. Entrants can also register and submit pies at the Market on the day of the event, at the registration table, until the 11:30 a.m. deadline on Sunday, August 21st. Judging will take place at noon on August 21st. Three winners will be selected by local judges. Judging criteria will include: overall appearance, crust puffiness and color, arrangement of peaches (in open-top pies), aroma, filling color, filling taste, and crust taste. Prizes will be donated by local businesses and sponsors (details to come!). The prizes will awarded at 1:30 P.M.
Market visitors will be invited to taste all the contest entries after the prizes have been awarded. Later this summer our first-place winner will go on to take a second version of his/her winning pie to a final judging site (to be announced at a later date) for 2 grand prizes: one in south/central Jersey; the other in north/central Jersey. Grand prize winners each will receive a check for $300 from the NJ Peach Promotion Council. The summer is flying by, so we wanted to share this Market news as soon as possible. 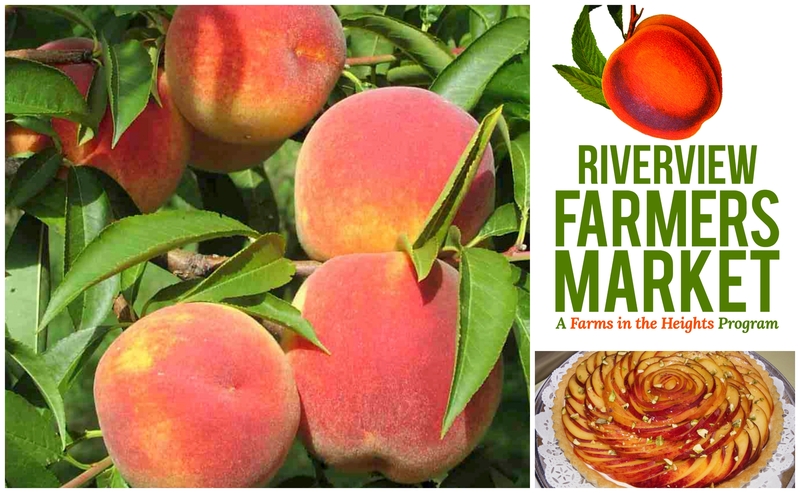 Mark your calendars for the Riverview Farmers Market’s Annual Perfect Peach Pie Contest on Sunday, August 2nd, 2015! Once again, the RFM is happy to be working with the New Jersey Peach Promotion Council on this event, which will also be the first round of a statewide competition. We’ll be sharing details soon — rules and regulations, plus the day’s schedule of live music and other programming — but we just wanted to let you know that this event is coming up, so you can start planning your peach pie if you’d like to enter to contest, or just save the date if you want to share in the fun! 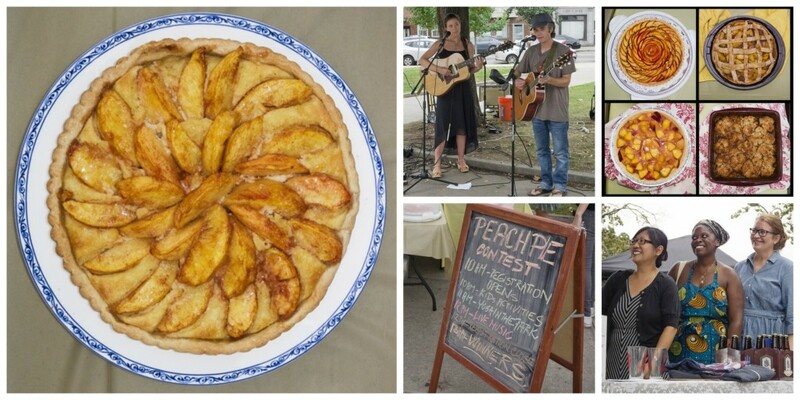 Photos of the Riverview Farmers Market 2014 Peach Pie Contest by Erin DeLaney. Peach Pie Contest Wrap-Up: Thank You! 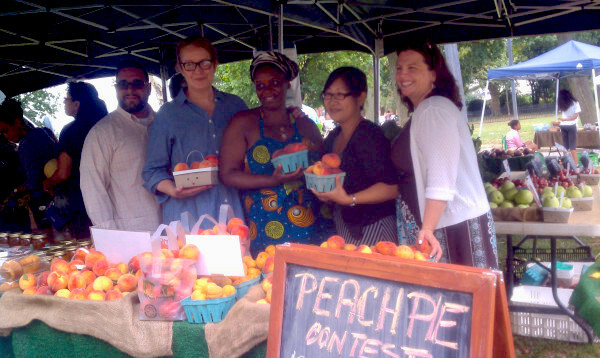 We hope everyone enjoyed the 2014 Perfect Peach Pie Contest at Riverview Farmers Market as much as we did! Ten peach pies and cobblers were entered in the contest and received a detailed and careful judging by our panel of four experts. We’re very grateful to our judges: Kern Weissman of Riverview Neighborhood Association, Kenneth Fields of Orange and Olive Caterers, Leslie Carrington of Jersey City Eats, and Fidel Hernandez of Buster’s NYC Spatinental Cuisine. 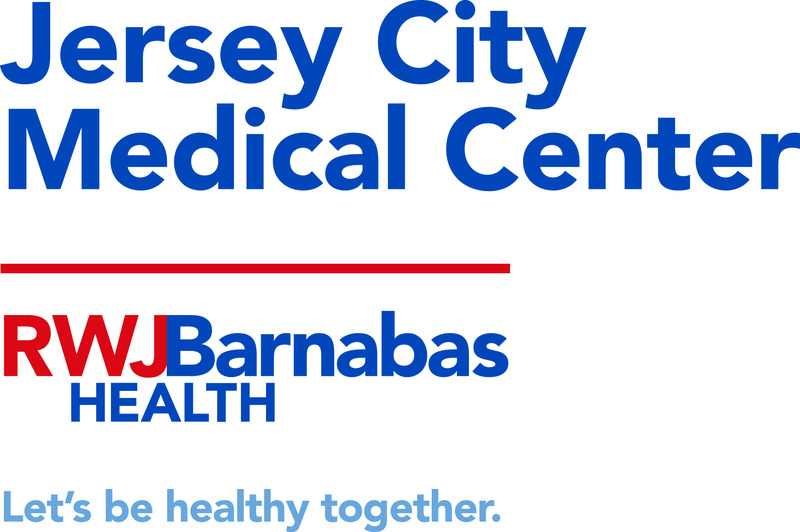 Joining them are Jersey City Councilman-at-large Dan Riviera (at far left) and Stacy Flanagan, Health & Human Services, City of Jersey City (at far right). Several local businesses generously donated great prizes: Orale Mexican Kitchen, Word Jersey City, NJ Beer Company, and La Isla Bonita. Thanks to everyone who entered the contest! All the desserts you made were delicious. 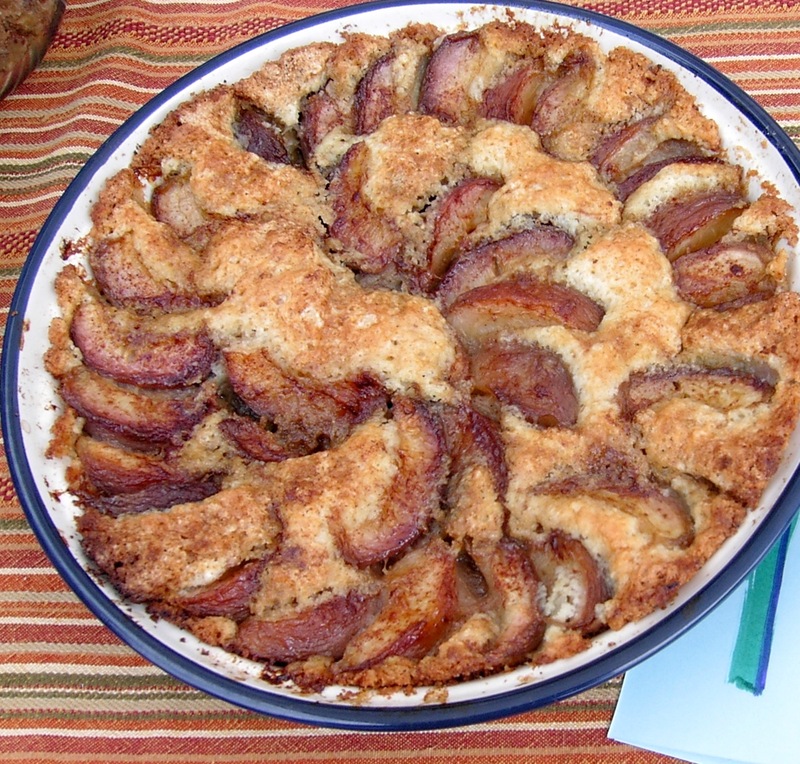 2014 Perfect Peach Pie Contest: Information and Registration! Calling all local amateur bakers! Do you have a favorite peach pie recipe and baking skills that you’d like to show off? 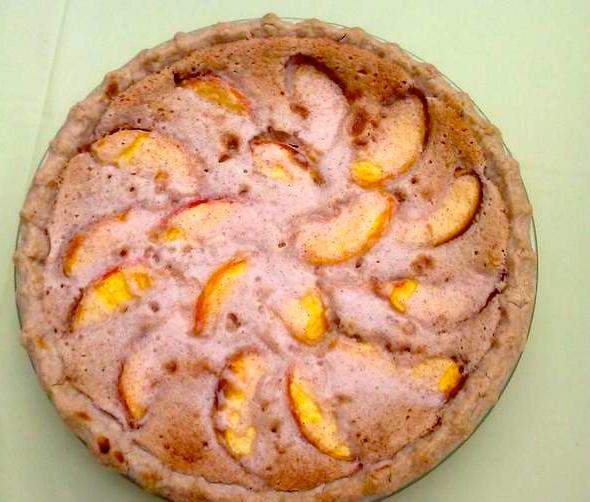 Submit your dessert to the 2014 Perfect Peach Pie Contest, hosted by the Riverview Farmers Market! The contest is sponsored by the New Jersey Peach Promotion Council. The date is Sunday, August 3rd. All participants must be amateur bakers and must use New Jersey peaches. Participants can submit a home-baked peach pie or peach cobbler; no other dishes will be accepted. The Perfect Peach Pie Contest judging and tasting will begin at noon on August 3. The contest judges will include Kenneth Fields, a sous-chef from Orange and Olive Caterers and Chef’s Table; Fidel Hernandez, cook and owner at Busters NYC Spatinental Cuisine; Rolando R. Lovarro, Jr., City Council President, Jersey City; and Kern Weissman, President of the Riverview Neighborhood Association. Prizes will be donated by local businesses and sponsors. The prizes will awarded by Mayor Steven Fulop at 1:30. 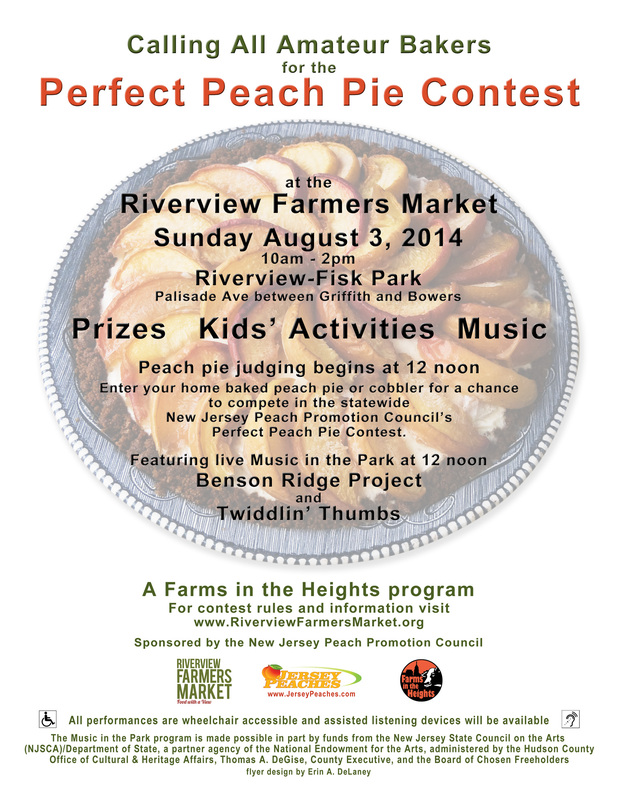 The Riverview Farmers Market’s 3rd annual Perfect Peach Pie Contest will be held on Sunday, August 3, 2014. Are you an amateur baker? Do you have a friend, family member, or neighbor who’s known for his or her skills in the kitchen? Just one month from today, the Market will be hosting a Perfect Peach Pie Contest, sponsored by the New Jersey Peach Promotion Council. There will be prizes, tastings, live music, children’s activities, and more. Celebrate Jersey’s state ranking as #4 for national peach production (60-66 million pounds per year!) and show off your own baking talents — or just join in the fun. More information will follow in the next week or two. Stay tuned for details about how to enter your own home-made peach pie or cobbler in the contest — and start thinking about your recipe!